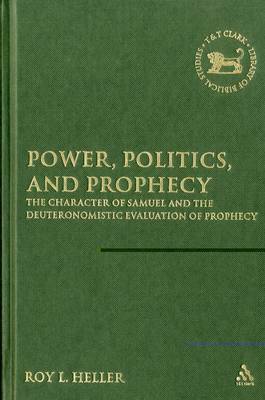 "Power, Politics, and Prophecy" is an examination of the view of prophetic experience and prophetic institutions by the writers of "Deuteronomy" and the "Deuteronomistic History" (Joshua - 2 Kings). The thesis of the book is that the Deuteronomic writers consistently hold two different and competing views on prophecy in tension: prophecy is a valid and true means by which God communicates the divine will and intention to people; and prophecy is a highly ambiguous and dangerous phenomenon and, because of its essential subjective nature, should be treated with a high degree of suspicion in all cases. These views are meticulously intertwined in the narratives about the character of Samuel and both are absolutely central for the meaning of the narrative and of its portrayal of the prophet. From beginning to end, Samuel is clearly understood by the writers as fulfilling the promise of Deuteronomy 18 as the Mosaic prophet, one who serves as the primary intermediary between the divine and human realms. Yet, unlike the sympathetic readings offered by some commentators, Samuel is obviously not an unambiguously positive character. "Heller offers an interesting, nuanced and largely persuasive account of the prophetic role played by Samuel." 32.5 (2008)--Sanford Lakoff "Journal for The Study of the Old Testament "
I have been shown the importance of recognizing the universal drive to power that conditions social and political relations between the sexes and-especially-between colonizers and the colonized, and this sensitivity to key aspects of the world behind the text can only help to make us better readers ... This collection is essential reading for any serious student of Jeremiah and highly recommended for those interested in a major turn in biblical studies that, if not about to displace the historical-critical method, has well and truly taken its own place at the table of 'normal' reading practices. Andrew Shead, "SBL Review""